Second-year resident in pediatrics at the University of Toronto in Ontario. Associate Professor in the Department of Family and Community Medicine at the University of Toronto. Acute aortic dissection (AoD) affects approximately 2000 people per year in the United States.1 The International Registry of Aortic Dissection (IRAD),2 the largest multinational registry of patients with AoD, reports that only 7% of patients with AoD are younger than 40 years of age, a factor that might not prompt a raised index of suspicion among clinicians caring for younger individuals presenting with chest symptoms compatible with AoD. Early and accurate diagnosis is crucial as the mortality rate of AoD might increase by approximately 1% per hour over the first 48 hours and can reach 70% at 1 week if left untreated.3 Because the average age of patients with AoD is 65 years,2 younger patients with AoD are especially likely to be misdiagnosed. This is illustrated in the following case in which a 37-year-old man with an AoD was thought to be experiencing community-acquired pneumonia. This case serves as a reminder to family physicians of the importance of developing broad differential diagnoses that should always include life-threatening emergencies. A 37-year-old male non-smoker with no relevant past medical history other than hyperlipidemia treated with a statin presented to his family physician complaining of central, anterior chest pain that was aggravated by deep inspiration and that radiated to the back. He denied shortness of breath, cough, chest tightness, wheeze, fever, or chills. He reported symptoms compatible with a viral respiratory tract infection approximately 7 days before presentation that had since resolved. Findings of the physical examination were unremarkable, with the exception of a mild tachycardia (108 beats per minute and regular). The patient was found to be afebrile, with a temperature of 37°C. 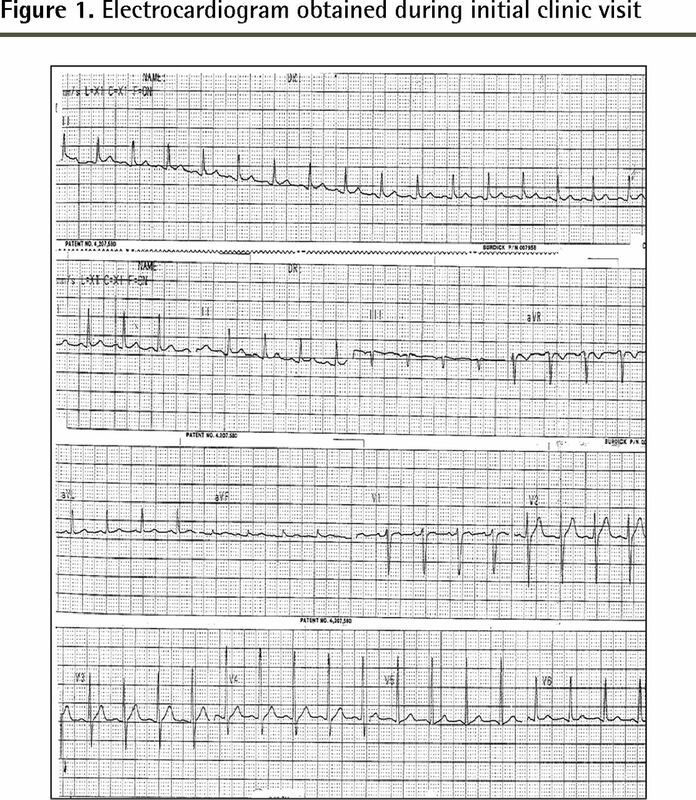 The patient indicated that he became aware of his elevated heart rate 2 days before presentation. An electrocardiogram (ECG) revealed a sinus rhythm at a rate of 100 beats per minute and nonspecific ST changes in some leads (Figure 1). Findings of a chest radiograph revealed mild cardiomegaly. The patient was immediately referred to a nearby emergency department (ED) for evaluation of possible pericardial or thromboembolic disease. In the ED, ECG findings were reported to be normal, with a heart rate of 99 beats per minute. His body temperature was recorded as 39.9°C. A chest x-ray scan completed in the ED revealed right lower lobe atelectasis and airspace disease consistent with pneumonia. There were small, bilateral pleural effusions and a mild degree of cardiomegaly. No further imaging was obtained, and the patient was discharged home with a prescription for antibiotic therapy and nonsteroidal anti-inflammatory medication for management of pneumonia and chest pain. Approximately 36 hours after being discharged from the ED, the patient collapsed while sitting at the kitchen table and his vital signs were absent; resuscitation efforts were unsuccessful. A postmortem examination revealed an AoD with an intimal tear approximately 1.5 cm in length just above the left coronary cusp. The dissection extended distally along the aorta to the bifurcation. The dissection also progressed retrograde with re-entry into the pericardial sac. Examination of the lungs revealed no evidence of bronchopneumonia. Death was attributed to acute AoD with hemopericardium and cardiac tamponade. In contrast to the risk factors of AoD, the signs and symptoms of AoD are essentially the same in all age groups.5 The most important presenting symptom is severe chest pain, which was reported by 90% of patients in the IRAD trial.2 The pain tends to be abrupt (85%) and is often described as sharp (64%) or tearing (50%).2 There is a tendency for the pain to migrate as the dissection extends, which can be a valuable clue in making the diagnosis. On examination, patients with AoD tend to be tachycardic and hypertensive, but hypotension can occur secondary to pericardial tamponade or hypovolemia. Blood pressure and pulse measurements are different between the upper extremities in 38% of cases.7 Auscultation of the heart might reveal a diastolic murmur of aortic insufficiency. Unilateral loss of breath sounds, usually over the left hemithorax, might be present owing to hemothorax or pleural effusion.8 Screening for signs of branch vessel involvement, such as neurologic features, abdominal pain secondary to splanchnic ischemia, or signs of lower extremity ischemia, can be helpful in making the diagnosis of AoD. Finally, a fever is occasionally associated with AoD and might be present in up to one-third of all patients with this condition.9 The difference in repeated body temperature measurements described in this case is difficult to reconcile; measurement or documentation error must be considered, as the visits to the family physician and ED were separated by only a few hours. Initial management of suspected aortic dissection involves analgesia and reduction of systolic blood pressure to a target of 100 to 120 mm Hg, usually with β-blockers.12 As patients with acute type A dissections are at the highest risk of life-threatening complications, they are generally treated surgically. Conversely, patients with uncomplicated type B aortic dissections are best treated medically.12 All patients should receive lifelong antihypertensive treatment and frequent imaging to assess for extension or recurrence. As family physicians are often the first point of contact for patients with AoD, they should be familiar with the risk factors and clinical presentation of this catastrophic condition. A high level of clinical suspicion should be maintained, and if aortic dissection is suspected it must be investigated in a timely fashion and should only be excluded by definitive testing. Acute aortic dissection (AoD) is rare, particularly in those younger than 40 years of age, but early and accurate diagnosis is crucial, as the mortality rate increases by approximately 1% per hour over the first 48 hours and can reach 70% at 1 week if left untreated. This case serves as a reminder of the importance of developing broad differential diagnoses that should always include life-threatening emergencies. The most important risk factor for AoD is a history of hypertension, which is found in up to 72% of patients. Younger patients who experience AoD are less likely to have a history of hypertension, but are more likely to have Marfan syndrome, bicuspid aortic valve, or a previous history of aortic valve replacement. The signs and symptoms of AoD are essentially the same in all age groups. The most important presenting symptom is severe chest pain that tends to be abrupt and described as sharp or tearing. This pain often migrates as the dissection extends, which can be a valuable clue in making the diagnosis. La dissection aortique aigue (DAA) est rare, surtout chez les personnes de moins de 40 ans, mais il est essentiel de poser rapidement un diagnostic exact, puisque le taux de mortalité augmente d’environ 1 % par heure au cours des 48 premières heures et peut atteindre 70 % après 1 semaine si elle n’est pas traitée. Le cas présent rappelle l’importance d’établir des diagnostics différentiels élargis qui devraient toujours inclure des urgences potentiellement mortelles. Des antécédents d’hypertension représentent le facteur de risque le plus important d’une DAA, ce qui est le cas chez jusqu’à 72 % des patients. Les patients plus jeunes qui sont victimes d’une DDA sont moins susceptibles d’avoir des antécédents d’hypertension, mais présenteront plus probablement un syndrome de Marfan, ou une valve aortique bicuspide, ou un historique de remplacement de la valve aortique. Les signes et les symptômes d’une DAA sont essentiellement les mêmes quel que soit le groupe d’âges. Son plus important symptôme est une grave douleur thoracique qui a tendance à être brutale et décrite comme vive ou comme une sensation de déchirement. La douleur migre souvent à mesure que la dissection s’étend, ce qui peut être un précieux indice dans le diagnostic.
. Gender-related differences in acute aortic dissection. Circulation 2004;109(24):3014-21.
. The International Registry of Acute Aortic Dissection (IRAD): new insights into an old disease. JAMA 2000;283(7):897-903.
. The natural history of acute aortic aneurysm disease: an overview. J Card Surg 1997;12(2 Suppl):270-8.
. Diagnosis and management of aortic dissection. Eur Heart J 2001;22:1642-81.
. Acute aortic dissection. Lancet 2008;372(9632):55-66.
. Characterizing the young patient with aortic dissection: results from the international registry of aortic dissection (IRAD). J Am Coll Cardiol 2004;43(4):665-9.
. Clinical prediction of acute aortic dissection. Arch Intern Med 2000;160(19):2977-82.
. Aortic dissection. In: Franco KL, Verrier ED, editors. Advanced therapy in cardiac surgery. Hamilton, ON: BC Decker Inc; 2003. p. 304-10.
. Dissecting aneurysm of the aorta: a review of 505 cases. Medicine 1958;37(3):217-79.
. Chest radiography for the diagnosis of acute aortic syndrome. Am J Med 2004;116(2):73-7.
. Diagnostic accuracy of transesophageal echocardiography, helical computed tomography and magnetic resonance imaging for suspected thoracic aortic dissection: systematic review and meta-analysis. Arch Intern Med 2006;166(13):1350-6.
. Acute aortic syndromes. Circulation 2005;112(24):3802-13.